Mrs. Marie Allen is in her sixth year at Westside Catholic School. After completing her student teaching, she was immediately offered a position as Classroom Aide in Kindergarten at the St. Agnes campus. She now in her fifth year as the second grade teacher. She is just one of those people who can solve about any problem. 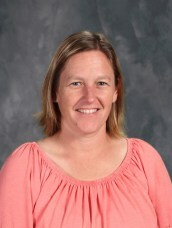 Mrs. Allen is married to Jason Allen and has four children who attend WCS—Austin, Makayla, Jackson, and Caitlyn. They like to ride bikes, shoot archery, and camp out in their free time.